As a result of the November 4, 2014 General Election, Jason Buckel, a Republican, defeated the incumbent Democrat, Kevin Kelly, in the race for Maryland House of Delegates, District 1-B. 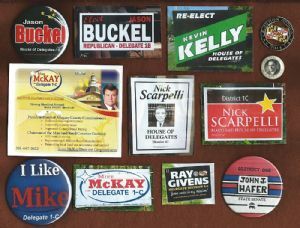 In the House of Delegates race, District 1-C, the Republican candidate, Mike McKay, defeated Nick Scarpelli, a Democrat. Nick Scarpelli, a Democrat, is running for the Maryland House of Delegates District 1-C in the November 2014 General Election. He had no opposition in the primary. Scarpelli is Pro-Life and supports the Second Amendment and gun rights. His focus is upon supporting business owners and entrepreneurs, as well as the encouragement of companies to become established in Western Maryland. Scarpelli notes that Western Maryland needs to become more involved in the state's political process and participate in its leadership for the benefit of our region. Mike McKay, a Republican, ran for and was elected to the Board of Allegany County Commissioners in 2010. He won the June 2014 Republican primary for the Maryland House of Delegates from District 1-C and will face the Democrat, Nick Scarpelli in the 2014 November General Election. McKay's motto is, "Moving Maryland Forward in the RIGHT Direction!" McKay was re-elected in 2018. Ray Givens was one of two Republicans running for the Maryland House of Delegates, District 1-C in the June 2014 Republican Primary. If elected he promised less bureaucratic regulations, lower taxes and smaller government. Givens firmly believes that "firearms are second only to the Constitution in importance." He lost in the primary to fellow Republican Mike McKay. Jason C. Buckel, a Republican and a lawyer, is running for the Maryland House of Delegates, District 1-B. His opponent in the November 2014 General Election was be the incumbent Democrat, Kevin Kelly, also a lawyer. Buckel supports a state repeal of Maryland's participation in "Common Core," opposes any increase in state taxes and fees, and endorses a state "Constitutional Carry" law that would allow any law-abiding citizen to carry a concealed firearm without a permit. Buckle won the 2014 election and was re-elected to this position in 2018. Harvey Joseph Speicher (1873-1939), a Republican, served in the Maryland State Senate from Garrett County from 1910 until 1920. He lived in Accident, where he once served as Mayor. Speicher was well known as a breeder of Belgian, Percheron and American farm horses. The button itself was made by the Hyatt (badges and buttons) Manufacturing Company of Baltimore, Maryland. The pin entitled, Election Official 2014, was issued to and worn by all the Allegany County Election Poll Workers on the day of the November 4, 2014 General Election. It features the Maryland state flag. John J. Hafer, a Republican, was a Frostburg businessman who served in the Maryland State Senate from January 9, 1991 to January 10, 2007. Hafer represented District 1, which includes all of Allegany and Garrett Counties as well as a portion of western Washington County. Hafer chose not to run for re-election in 2006. He was preceded into office by John N. Bambacus and succeeded by George C. Edwards, both of whom are referenced elsewhere on this website.